Saratov Journal of Medical Scientific Research (ISSN 1995-0039 Print, ISSN 2076-2518 Online) is an international peer reviewed open access journal published since 2005. Abbreviated key title: Saratov J. Med. Sci. Res. Publisher: Saratov State Medical University. 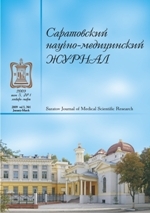 Saratov Journal of Medical Scientific Research publishes high quality medical news, original research, and reviews in English or Russian language in all aspects of clinical medicine and public health. In Saratov Journal of Medical Scientific Research, we using Attribution-NonCommercial license (CC BY-NC).